We build full HD ready to go antenna systems! Smallest and most efficient KU band package! The SatCrew-KU12 is a KU 1.2m-based premium portable video broadcast system. Consists of 4 boxes, 2 for antenna and 2 for electronics. Deployment of whole system can be done in as little as 20 minutes. Most popular C band package! The SatCrew-C18 is a C band 1.8m-based premium portable video broadcast system. Consists of 5 boxes, 3 for antenna and 2 for electronics. Deployment of whole system can be done in as little as 20-30 minutes. Our biggest C band antenna package! The SatCrew-C24 is a C band 2.4m-based premium portable video broadcast system. Consists of 8 boxes, 6 for antenna and 2 for electronics. Deployment of whole system can be done in as little as 30-45 minutes. Full Layout Diagram Let us design your next system at a cost you can afford. We work incredibly smart and efficient. We'll apply our engineering talents to create cutting-edge, cost-effective solutions for you, and we’ll treat your needs as our top priority. 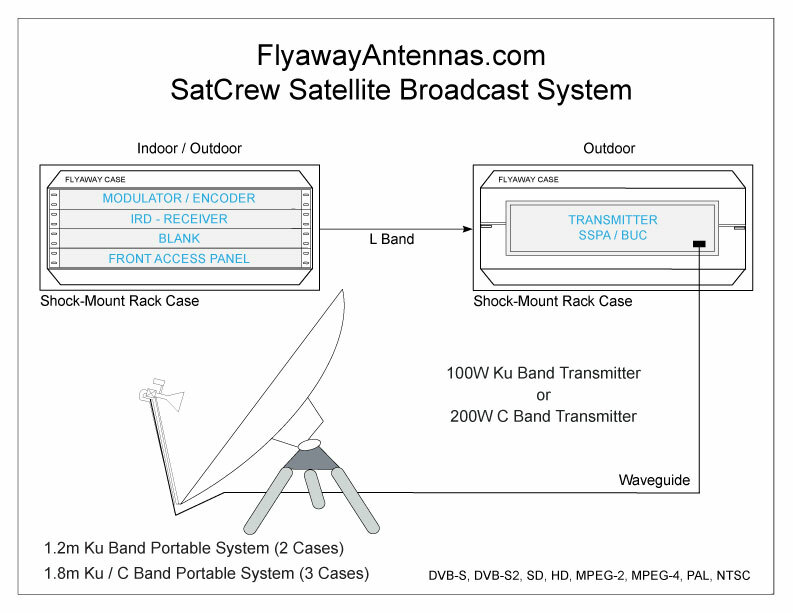 © 2019 Flyaway Antennas, LLC . All Rights Reserved.